Gum disease is a widespread problem and is often why patients lose their teeth. This occurs when the plaque that sits around the gum margins of the teeth accumulate. It can make your gums appear red, swollen and bleed a little when you brush or floss. 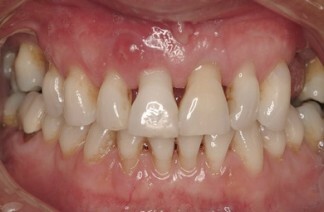 In its early stages the “bleeding gums” is called gingivitis and is reversible. Gingivitis can be treated easily by brushing your teeth along the gum lines and flossing regularly. This can then also help to prevent gingivitis from returning. Also visiting the dentist regularly for examinations, scaling and polishing helps to keep your gums healthy. However if teeth and gums aren’t properly cleaned for a while and hard plaque deposits (called calculus or tartar) form, the bone underneath the gums can become inflammed and can then shrink away from around your teeth eroding the foundation around the roots. 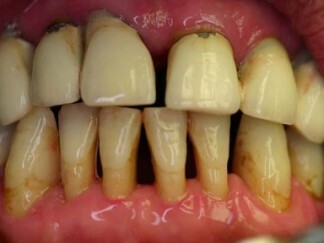 This is when you have Periodontitis. Gaps start to occur between the teeth and deep gum pockets form, and the teeth become loose. As the bone slowly shrinks away, the gums covering it shrink back also and eventually all the bone holding the tooth disappears. Because this happens so slowly and is usually painless, patients are often unaware of what is happening until it’s too late. When this happens, the tooth either falls out on its own or is too painful because it’s so loose, it needs to be extracted. Good oral hygiene such as brushing correctly and cleaning in between the teeth as well visiting the dentist regularly can help prevent or treat gum disease. However, sometimes you may need to be referred to a dental specialist called a Periodontist who treat more difficult cases. 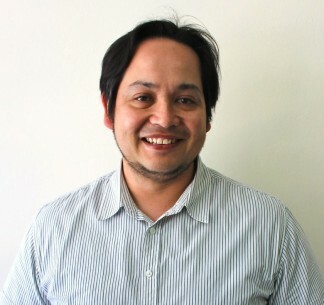 Dr Jason Watson has been with Seymour Dental since 2007. 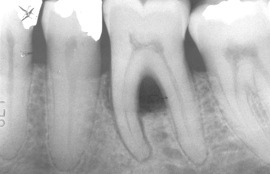 Receding gums showing exposed roots and larger spaces between teeth. Also swelling in gum above front tooth. 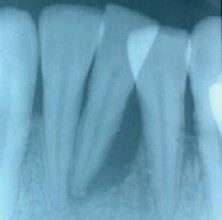 Xray of bone loss to the apex of the tooth - needs to be removed	 Bone loss on molar tooth to apex of multiple roots under a bridge	 Bone loss between the roots on a lower molar tooth. This is in the furcation area. 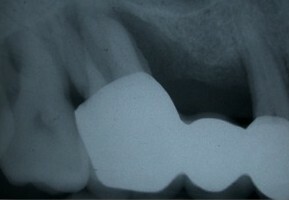 Healthy gums after gum surgery, but the bone height is usually lost forever with gum disease!